"I genuinely believe I have never taught mathematics better, and my students have never learned more. I just wish I had known all of this twelve years ago. 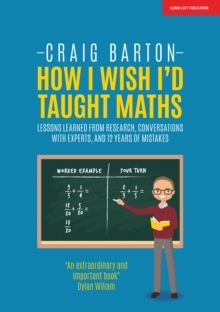 "Craig Barton is one of the UK's most respected teachers of mathematics. In his remarkable new book, he explains how he has delved into the world of academic research and emerged with a range of simple, practical, effective strategies that anyone can employ to save time and energy and have a positive impact on the long-term learning and enjoyment of students. Craig presents the findings of over 100 books and research articles from the fields of Cognitive Science, Memory, Psychology and Behavioural Economics, together with the conversations he has had with world renowned educational experts on his Mr Barton Maths Podcast, and subsequent experiments with my students and colleagues.